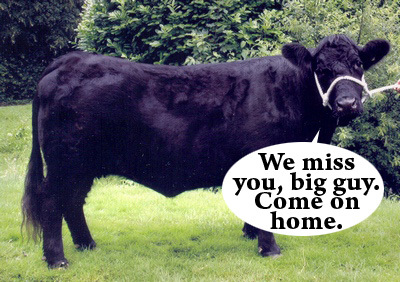 So Martin Thomas has stepped down from his role as acting chief executive at the RFU, ostensibly to spend more time with his Pedigree Welsh Black Cattle. Now, it’s a well known fact that the Mole is no expert on rugby; you’ll doubtless be surprised to hear that he’s no expert on livestock either. Still, that’s a nice-looking cow, as cows go. Is it really enough to drag you away from the top job at the most financially successful union in world rugby, though? Thomas is leaving a lot of choice positions behind: as well as the RFU job, he’s also saying goodbye to places on the IRB Council and the Six Nations Committee, a directorship of European Rugby Cup Ltd and his chairmanship of Rugby World Cup organisers England Rugby 2015. That’s some portfolio of roles. It’s also a hell of a lot of power held in one hand, a huge workload and an enormous degree of responsibility for a 67-year old gentleman farmer. It would seem entirely credible to take the viewpoint that the RFU has barely changed in the sixteen years since Will Carling’s famous appearance on the Channel 4 show Fair Game. His classic quote from that night reads in its entirety: “If the game is run properly, you do not need 57 old farts running rugby”. There’s a strong argument that the RFU is not running the English game properly, or at least not running it optimally – or even close to optimally. The English national team was absolutely riven with scandal at the World Cup, played a poor brand of rugby and were knocked out at the quarter-final stage by a non-vintage French team who only bothered to show up for half an hour. English coaching staff were guilty of cheating during the tournament and playing staff were guilty of all sorts of minor misdemeanors, both on and off the pitch. Even in PR terms – a winnable war, such was the begrudgery dished out to neighbors Australia by the New Zealand press – they completely screwed the pooch, and finished their tournament as the most disliked team on the two islands. S-U-C-C-E-S-S, that’s the way you spell an absolute disaster of a World Cup. England are the current Six Nations champions. That shouldn’t go unsaid. However, with their vast playing numbers and the inadequacies of Scotland and Italy at international level, they should always be in contention for the tournament. From 2003 until 2010, they have finished second a couple of times [’08 & ’09], third three times [’04, ’07 & ’10] and fourth twice [’05 & ’06]. That’s not a staggering roll of honor by any means. At club level, the Premiership is a reasonably healthy league financially [and certainly far more wealthy that the Rabo Direct Pro 12], but it falls between stools on the performance front. In the last World Cup cycle – since Martin Johnson took over the management of the English national side, in other words – no English team has won the Heineken Cup. The Premiership, with all its biff and rattle, is heavily stocked with players who aren’t eligible to play for England. The situation exists then there the clubs are importing players who can’t play for the English national side, but also aren’t getting them over the line in terms of winning them big trophies. The clubs are neither wholly successful rugby nurseries, nor are they wholly successful franchises: most of them are simply muddling along. There’s growing discord between the Haves [Leicester, Saracens, Northampton] and the Have Nots [everybody else] over the salary cap. However, as noted before in the St Boshington’s Report Card, England have talented players, a better age-profile than most would give them credit for, and a seriously gifted bunch of U20s coming through the ranks. The RFU is an ungainly organisation that limps along on gouty trotters, and needs both a change of personnel and a change of structure. While the Mole is a confirmed Doubting Thomas when it comes to the Rapture of Sir Clive, at least the bugger actually had an idea what he wanted English rugby to do. This entry was posted in Opinion and tagged 57 Old Farts, Football - Association or Rugby?, Justice Cocklecarrot, Martin Thomas, St Boshingtons by dementedmole. Bookmark the permalink. This is one I often ponder….is it better to have a wide range of teams and players to pick from (i.e engerland) or to have pretty much a theoretical maximum of 4 players of varying degrees of ability per position (oireland)? England have the resources and ability to be world leaders, but they haven’t managed their structures or players well. Look at a player like tait. Initially the next big thing, then one big tackle where henson picks him twirls him around and bruno antonoli shouts 10! and next thing we know he disappears for a few years, only to return to a world cup final, only to disappear again, only to be signed by leicstershire and hyped all over again. If he were from here he’d possibly have 2 heineken cups and have been in international squads steady for years. You could say the same of noon. We have a nice gradual progression – school/club,academy, b and i cup, rabbo, maybe Churchill cup/Ireland A, heineken, international. It lends itself to contingency, experience and lots of caps (like the mafia it is arguably harder to get dropped by a province or the national team than it is to get in!). Last night’s game was an amazing statement of the quality currently concentrated in Ireland. To me Johnson has tried to change it a bit, by not initially listening to the clamour to pick foden or youngs for example, but now they are established internationals. Hopefully they axe MJ. Although, in fairness the buck does have to stop with him regarding some of the antics that have went on. The warning for us is to avoid over hyping good youngsters and then discarding them. Also to facilitate improvements in ulster and connaught, without damaging the quality of the big 2, for even with mis-management it is a challenge to compete with the advantages England and France have. Also it will be interesting to watch the evolution of the Welsh model (established internationals going to France) and whether that helps or hinders the national team. It is my opinion if we can continue to reward loyalty and continue to give youth its appropriate chance, then we have a potent mix to push on and overtake France, Australia, and go close to south Africa and NZ over the next few years.